I needed to take a break from the darkness and experience the environment I’m in. The last few months, I’ve been busy and bogged down by lots of detail work and planning for the future and in the process, forgetting to be present in the here and now. It’s far too easy sometimes for me to get caught up with the “big picture” and forget to take notice of where I am or even who I am. When that happens, I know I need to get out of my “norm” in order to take notice of who I really am. As I walked through the village of Carmel my first evening in town, my visual sense was on overdrive as I passed by gallery after gallery. I was overwhelmed by the energy I got from seeing the colors, shapes and textures of the paintings and sculpture, through the shop windows. Art is everywhere in this small town. Carmel has a vibe all of its own and this film festival reflected that in every way. Last night was a filmmaker dinner and party on the beach. 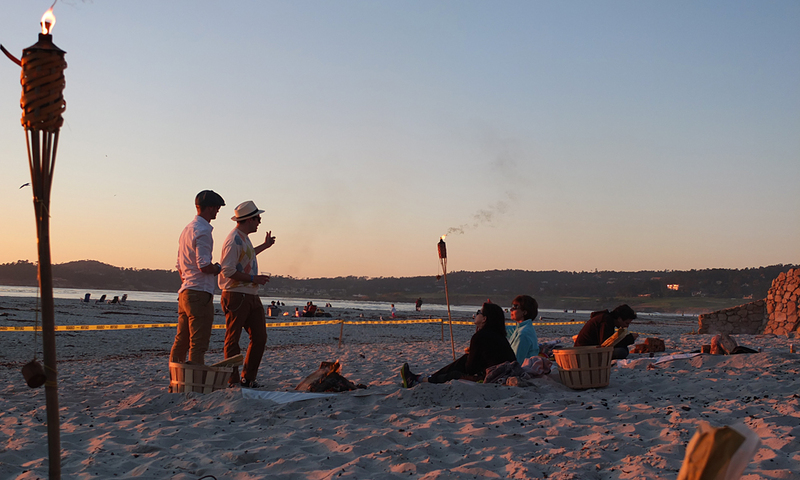 It was a very memorable evening, sitting around fire pits on the beach, drinking wine, watching the sun go down and having wonderful conversations with other filmmakers and artists. I looked up at one point just to look at the millions of stars in the dark clear sky and I knew exactly where I was. These days many small towns have lost what is unique about them, swapping their identities for strip malls and corporate brands. It’s no wonder; we can hold onto our own identities or even think about who we really are in our homogenized culture. I think we all forget sometimes to stop and really be present in the place or situation we are in – instead of always thinking ahead – or worse yet lamenting the past. We get sidetracked sometimes by lots of things and people who have different priorities and agendas for you, and before we know it, we end up letting all that “stuff” take us away from our own purpose. When that happens, we aren’t happy and when we become unhappy, we make other people unhappy. I feel grateful today. Not only am I proud to be part of this amazing film festival but also I’m grateful that this beautiful little spot on Earth has fed my soul with inspiration. This entry was posted in Travel and tagged art, beach, being present, Carmel, Carmel Art & Film Festival, filmmakers, galleries. Bookmark the permalink.